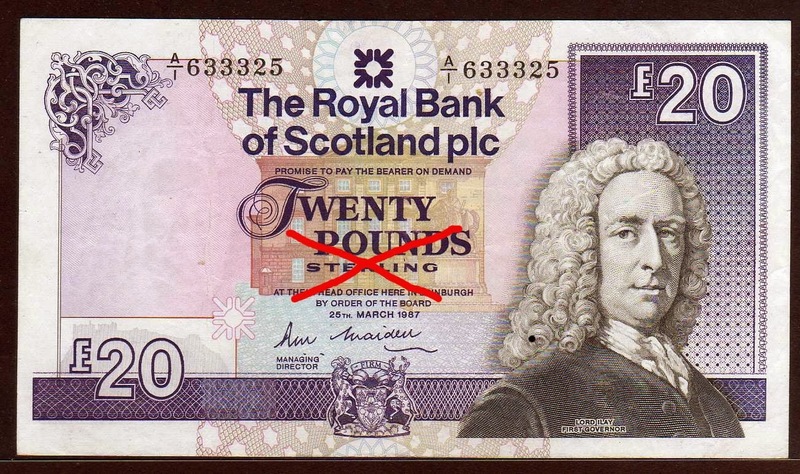 Iain Roberts' Blog: Scotland's Vote 15: Why does currency matter? As Alex Salmond said in the debate on Monday, there are 190 or so independent countries in the world, and all of them have found a currency solution. I have no doubt Scotland would muddle through somehow. The UK made an involuntary exit from the ERM on Black Wednesday in 1992, at great cost to British taxpayers. Ireland's membership of the euro led to crushing austerity measures, which make Osborne's cuts in the UK look mild by comparison. After the dissolution of Czechoslovakia in 1993, the currency union between the Czech Republic and Slovakia fell apart in less than 8 months. This points to the fragility of currency union without political union. In this case the damage was fairly light, but for reasons which do not apply to Scotland. The former Czechoslovakia was less than four years removed from Communism; external trade was limited and the financial sector was minimal. In 2002 Argentina was forced to abandon parity of its currency with the US dollar. After the link to the dollar was broken, the peso lost 75% of its value almost immediately. Getting this right the first time really matters; especially for Scotland, which has a very large financial services industry in proportion to its size. Scottish banking is estimated to hold assets equal to 1254% of GDP (as opposed to 492% for the UK as a whole) and make up 8% of Scotland's onshore economy (similar to the UK as a whole, including the City of London). This compares to 4.7% in France and 4.4% in Germany. A mistaken currency regime would have serious consequences. Scottish financial institutions do a lot of business south of the border, and those accounts would continue to be denominated in sterling. Conversely, Scottish domestic accounts would have to be denominated in whatever currency Scotland used. If Scotland experienced a currency crisis, such as breakdown of a currency union or ERM-style ejection from a fixed exchange rate, the value of Scottish currency would fluctuate unpredictably, with corresponding loss of confidence in Scottish banks. At this point, customers on either side of the border might well transfer their sterling assets to safer institutions in rUK. The effect on Scotland's financial sector, and its wider economy, would be severe. Scotland might end up joining the euro, with all its disadvantages, simply in order to protect its financial services industry. It is not good enough for Scotland's currency regime to be decided behind closed doors by the SNP leadership. An issue of this importance deserves an open and democratic debate; but the SNP has done its best to prevent one. In the event of a Yes vote, the SNP will have to pivot away from campaigning. Separating the governing structures of Scotland from those of rUK would entail complex and delicate negotiations. Getting the best possible deal for Scotland would require patience, realism, and diplomacy. These virtues have been notably absent from the SNP's campaigning. For now, the SNP's only concern is to get a Yes vote. If that happens, I imagine both sides will try to put campaign rhetoric behind them and get down to the practicalities of separation. The SNP's posturing over currency is so detached from reality that I seriously doubt if they can do this. If their words accurately reflect their beliefs, they may not have the necessary pragmatism. If they do not believe what they are saying about currency, it is doubtful whether they should be believed on anything at all. In my view their behaviour has done real, lasting, and unnecessary damage to their credibility as a negotiating partner. Join the euro (the Ireland option). Salmond could have committed the SNP to one of these alternatives. He could have said, "We believe a currency union is best for Scotland, and we will try to strike a bargain for one; but if the rest of the UK refuses to cooperate, we will instead adopt this currency policy." That would shift the referendum debate onto the merits of the chosen alternative, which is not where Salmond wanted to fight. Instead we have the unedifying spectacle of the SNP insisting they can bend Westminster to their will, and secure a currency union for Scotland. They say this regardless of the clearly stated policy of the Conservatives, Labour and the Liberal Democrats, as well as an overwhelming majority of public opinion south of the border. It is totally unrealistic and Scotland deserved better from its referendum debate. In 100 years, none of this will matter; but chances are, none of us will be around to see that time. If the independence transition is botched, Scotland could be paying for it for a generation.